I feel like we need to follow up after last night's episode on CBS, however I am fresh out of clever puns for the title of this post. Or even unclever puns. Whatever. Today is Monday, and tonight's show will be broadcast live on CBS. Apparently there will be a live PoV competition followed by a live PoV Ceremony and eviction. I don't even think they've picked the PoV players yet, but if they have I don't know who they are yet. Omarosa and Keisha are on the block for eviction, but the general plan seems to be that Shannon Elizabeth will be the target for a "shocking" backdoor nomination and eviction. The chatter in the house has been very loud about all of this---I think only Shannon and James are the ones who don't know about it. Did they tell Metta about it though? Would he understand it if they did? Who would Metta vote out if the choice is Keisha vs. Shannon? Omarosa vs. Shannon? Or if the nominations remain Keisha vs. Omarosa? Metta's actions in the house have been so damn stupid that some house guests think he must be America's Player or something. Did you know that after the Bowlerina competition (or maybe during) Metta left the house through the door in the backyard? And he talked to "some of the people across the street"? Over the years I've heard that there is a competition set staging area just outside the wall...we've seen that area in footage when Jeff and Jordan rolled up in a golf cart to host a BB12 competition, I think. Remember that? When Brendon threw a tantrum and threw a heavy ball that almost hit Big Jeff in the head? But I digress. Those are 50's style bathing beauties in the window there behind Metta. For all we know he's been talking to them, too. And we need to discuss Omarosa. AGAIN. 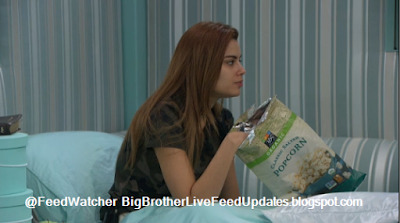 She came back from her medical interlude with a new attitude, saying she was on heavy meds and sees the situation in the house differently. Oh, and she said she got to talk to her husband, too. And suddenly Omarosa was ready to join the group again, participating in all of the group activities. HERE'S THE THING: I believe that Production had a Come To Jesus meeting with her about all of the racial talk she was spewing in the house. I believe they told her that if she continues with it, they will have no choice but to show all of that on the CBS show, and that would all but kill any chance of further opportunities with CBS. Maybe Omarosa's husband told her that opinions were rapidly shifting about her....that the fans had been enjoying her antics but her hateful talk was getting the wrong attention. 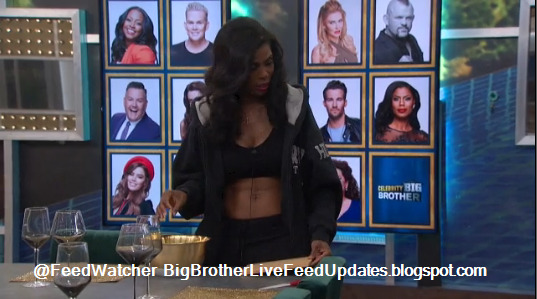 SOMEBODY gave Omarosa some significant outside information, because yesterday on the live feeds (around 3:08 or 3:09 PM BBT) Omarosa was whispering with Keisha and I clearly heard her say that "Malcolm went hard in the paint" in the press to defend Keisha "and their dad". This was a clear reference to the TMZ story a few days ago. (I discussed that here.) I was watching this while I was on my treadmill and almost fell off as I scrambled to Tweet about it. WAS OMAROSA REALLY ILL? I highly doubt it. I believe she might have asthma, and I know she felt horrible after Marissa spanked her in that competition, but I do not believe she had an asthma attack significant enough to require nearly 24-hours of medical attention. She was certainly waiving around a huge bag of meds on the live feeds yesterday, and the note that Ross read to the group stated that Omarosa "went" to the hospital. But I think she was ready to take her marbles and go home, and maybe her husband talked her out of it. Or Production had some stiff words for her about it. This is Omarosa we're talking about, people. Did you see her little "cough" in the DR last night? C'mon....even she doesn't think the fans are dumb enough to fall for this. But plenty of them are.....but not me. I wish I was dumb and naive. I would have had a much happier life if I didn't know what was really going on out there. Also, after all of their nearly 24-7 Omarosa Coverage, all TMZ had to say about the story is the little tidbits that we heard on the live feeds. They had no new info about it, not even the hospital where she was supposedly posted up. And we all know TMZ has the juice, so to me this is more evidence that the event was mostly hype. Kevin Schlehuber is now a live feed watcher for the first time, and has said that Metta is a lot like he was, not understanding anything about the game or it's jargon. 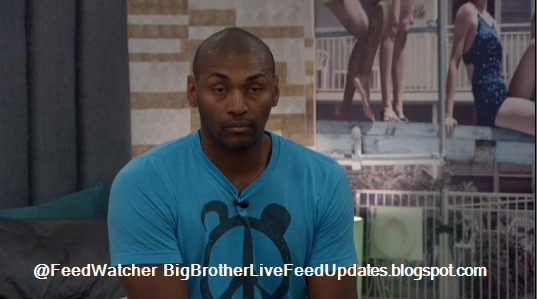 Kevin says he is rooting for Metta, Mark, James and Shannon. Metta just learned about the live feeds last night. He also spoke yesterday about how he hates the term "Black History Month", because his skin is brown, not black. Keisha got VERY upset about this conversation, and had to leave the room. But then Metta discussed it with Omarosa and she said she'd like him to speak about his views at Howard University. And Keisha calmed down eventually. Metta said his wife's father is "100% Japanese", and her mother is a mix of black and white, so I'm sure she is gorgeous. That is a great mix for smooth, wrinkle-free skin. I think her name is Maya. But get this...Metta was sitting at the kitchen counter and he said after he gets home, he wants to go to Toronto. (Does he have a home there? Does he live there?) I could have sworn he then said he needed to see his girlfriend, because for all he know, she could have moved on by now. Mark and James were sitting right there, too, and did not comment on this. I know how NBA players roll, but they usually aren't wearing microphones talking about it with thousands of people listening. This year the cold cuts are wrapped in butcher's paper, not just a plastic bag. So plush. This is Mark making a sandwich, but the cameras didn't give me the detail about the sandwich that I usually like to provide on this website. Omarosa announced that she learned she has lost 4 pounds since she's been in the house, and then she proceeded to repeat this over and over as each person came in the room. Omarosa had a bag of trinkets that she let Keisha rifle through to pick what she might like to borrow, or maybe even keep. Keisha reported that she was able to make that bun in her hair on the first try, which is somewhat of a miracle so she didn't want to mess with it unless she had to. Omarosa said that "they" told her that they wouldn't be changing any of the competitions to assist her "medical condition" because everything is planned in advance. They all agreed that they can hear the constant construction in the backyard as the crew continually works to ensure that this brisk Production schedule can be followed throughout the series. Oh, did you know that Omarosa has lost four pounds? No? Well, Omarosa has lost four pounds since she came in the house. Ari has a bandage on her left pinkie finger. I'm not sure if that happened during her baby crawling phase, or if it happened during a competition. She said the medic told her that it looks infected and they were going to talk to Production about it. Tending to Ari's hurt finger is probably the best gig that medic has ever had, right? She is STUNNING and actually very perceptive about what is going on in the game. The camera shows us a glimpse of Omarosa's significant wedding ring system, as well as the fact that she is using a plastic knife. Did they take the real knives? I think they should.....there is too much occasional aggression in there, not to mention a few house guests with questionable impulse control. You do know that Ron Artest climbed up into the bleachers to attack a fan who was heckling him during a basketball game, don't you? Maybe Metta World Peace wouldn't do that, but Ron Artest certainly would. Here's a good Omarosa story from the live feeds: She was dining out with her husband and when the bill came, her husband automatically slid the little pleather folder over to her because she is always the one to review the bill and calculate the tip. (SHOCKER.) Omarosa saw that the waitress had written her phone number on the bill with a little note to her husband. Omarosa didn't show her husband...instead she told him she saw a problem with the bill and got up to show the manager. The waitress was removed from her job that day. She lives with her husband in Jacksonville Florida, apparently. I love that Tiffany Room, even though they can't call it that. When the beds are made they even look like they have that white satin ribbon on them, like a little Tiffany's gift box. Anyway, my point is I love Ross and love that he's playing so hard. I hope he's ready for the backlash if he indeed goes through with the plan to backdoor Shannon. If he takes a shot, he'd better make sure it kills her. Because if she manages to stay......lots of fake tears are on the horizon, I predict. Ariadna eats frequently but she nibbles in little bites and doesn't overdo it. That must be the key. 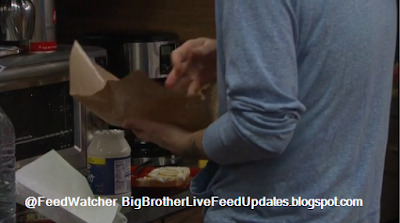 Last night Ross was snacking in the HoH and tried different combinations of flavors. He put Chilulo sauce (or whatever) on a Cheeto and said it was a staggering flavor combination. He then made ONE of these snacks for Brandi and Ari to taste. They only ate ONE, instead of shredding through the whole bag like we would do. And Ross also tried dipping a cheese puff into peanut butter, and reported that it tasted just like those square orange crackers with peanut butter between them that you see in vending machines. And once again they all tasted ONE and seemed satisfied with that. These super skinny girls must be from another planet. Planet Willpower. Well I have wasted enough time today. It was a rainy weekend here in Atlanta so it seems like everyone started getting their tax documents together. As usual I will be tweeting today and will let you know if something juicy is said or done. MWP went after a fan because the fan tossed a beer at him from quite a distance while he was laying on the scorers table. It was more than heckling so I wanted to point it out. Love your updates. Those beers at the games are so expensive! Maybe that guy deserved to get smacked around, then. 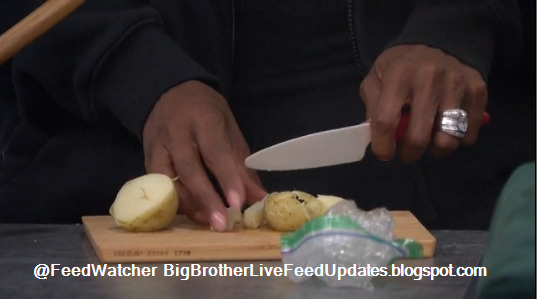 Feed Watcher, the knife that Omarosa is using appears to be ceramic (vs. plastic). And those can hold just as sharp an edge as the steel ones, so be careful! Keep up the great work, glad you're giving us even the limited updates for CBB.